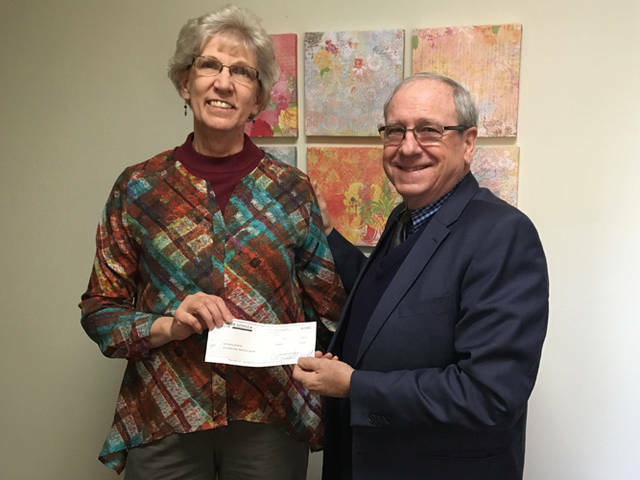 Mercer Savings Bank employee Milt Miller selected Our Home Family Resource Center to receive a $200 donation as part of the bank’s Mission of Giving. Miller is pictured with Kathy Mescher. 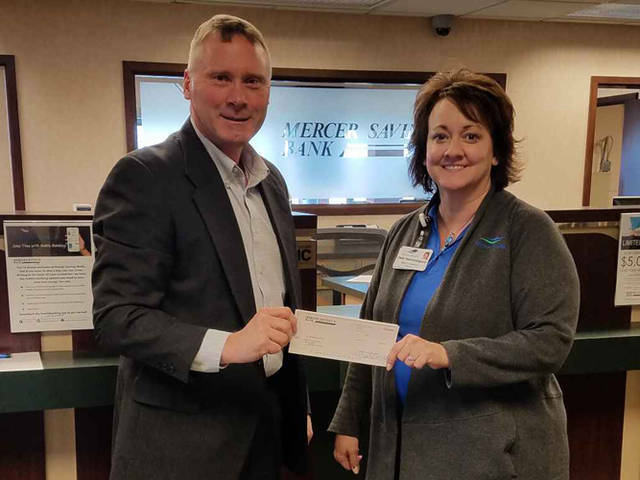 Mercer Savings Bank employee Rick Ross selected the MED Foundation to receive a $200 donation as part of the bank’s Mission of Giving. Ross is pictured with Deb Hemmelgarn, director of MED Foundation. 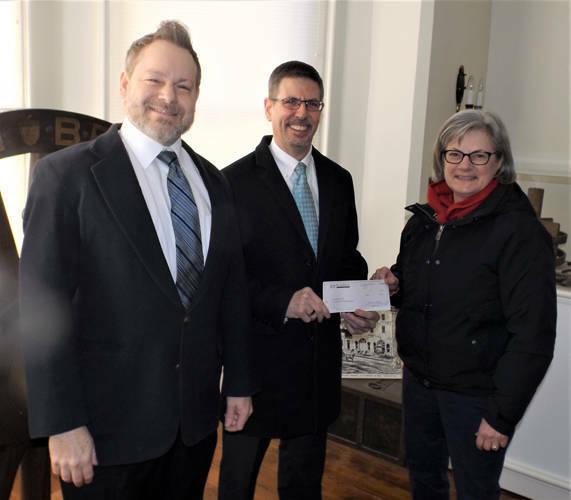 Mercer Savings Bank employee Tim Bigham selected the Auglaize County Historical Society to receive a $200 donation as part of the bank’s Mission of Giving. Bigham is pictured with Dane Daniel and Rachel Barber. 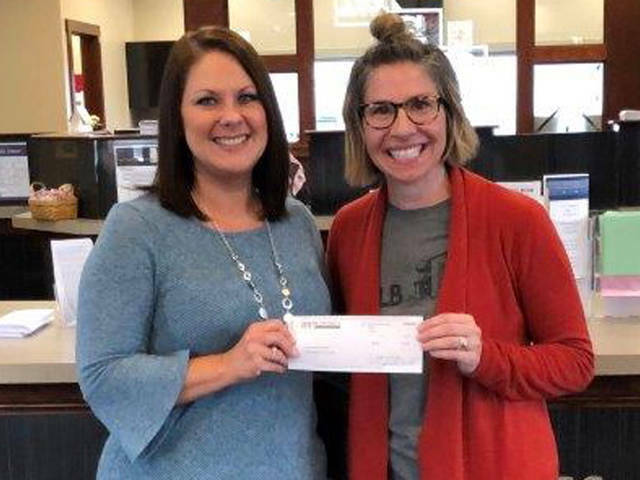 Mercer Savings Bank employee Shawna Stewart selected The House That Lulu Built to receive a $200 donation as part of the bank’s Mission of Giving. Stewart is pictured with Camilynn Snyder. CELINA – As a mutual bank, Mercer Savings Bank has always been deeply rooted in the communities it serves and, as part of that, believes that reinvesting in those communities should be a large part of its mission. Through their Giving Mission, each month three employees will be selected to choose a charitable organization to receive a $200 donation. Employees are requested to choose organizations that exemplify the values of the bank as a whole. Tim Bigham chose the Auglaize County Historical Society. Rick Ross chose the MED Foundation. Milt Miller’s selection, Our Home Family Resource Center, is a family of programs, sharing a concern for strengthening individuals and families in Mercer County. The primary function of Our Home is to provide a central entry point through which people in Mercer County can find and receive support during times of need. “Along with so many other valuable services, Our Home provides a safe haven for battered and abused children and women along with the counseling that is so important to the recovery process,” Miller said. Shawna Stewart chose The House That Lulu Built.